Sometimes what politicians don’t say is as important as what they do say. 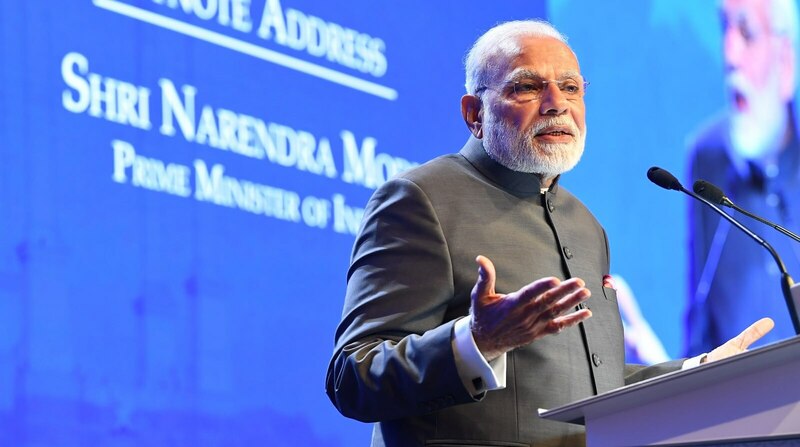 So it was with Prime Minister of India Narendra Modi’s keenly anticipated keynote at the Shangri-La Dialogue this year. The speech could have been fiery, as Modi’s rhetoric often is in front of a domestic audience. But as has become his style in international settings, it was discursive and emollient. Modi’s address was intended to reassure, and hinted only obliquely at some of the challenges confronting India and the region. And although he framed his keynote in terms of the Indo-Pacific, its message was aimed for the most part at Southeast Asia. He barely mentioned the region’s major powers and other significant players on the periphery, such as Australia or Japan. He stopped well short of criticising China or any other state by name. The “Quad” was not spoken of at all. prosper as sovereign countries ... free and fearless in their choices ... when the oceans are open, the seas are secure, countries are connected, the rule of law prevails and the region is stable. Characteristically, Modi wrapped this argument in much florid prose about ancient cultural, religious, linguistic, and economic connections between India and Southeast Asia and beyond. But the bottom line was much more modern. The vision of the “rules-based order” he articulated was a patchwork of post-1945 laws and norms. At its core lie the norms of sovereignty, sovereign equality, non-intervention and non-interference, and respect for territorial integrity, as laid out in the UN Charter and reaffirmed in the postcolonial era by statements of principle such as the so-called “Panchsheel”, first agreed between China and India in 1954. Together, Modi argued, these laws and norms help manage the challenges arising from “diversity of culture, religion, language, governance and prosperity” that clearly exist in groups such as ASEAN. So too do adherence to the principle of consent, commitment to the rule of law, and “faith in dialogue”, which he identified as operative rules. States in this region and beyond should thus privilege multilateralism, ensure open and equal access to the global commons, and sustain an “open and stable international trade regime”. Finally, states ought to promote greater connectivity, underpinned by “respect for sovereignty and territorial integrity, consultation, good governance, transparency, viability and sustainability”. In sum, in this speech, Modi’s conception of rules-based order blended small “l” liberal or pluralist commitments with a hedged acceptance of parts, but not all, of the liberal economic order forged mostly by the West since the 1970s. Without calling-out Beijing or Washington by name, the speech contrasted this order with the alternative that would likely arise as a result of recent behaviour by both China and the US, among others. “We see growing mutual insecurity and rising military expenditure”, Modi observed, “internal dislocations turning into external tensions; and new fault lines in trade and competition in the global commons”. If we don’t adhere to agreed rules and norms, he warned, we could slip towards a region of “great power rivalries” in which small and middling states will see their ability to make free choices narrow or disappear, affecting prosperity as well as peace. As a pitch to Southeast Asia, in particular, this argument was carefully calibrated, playing on long-standing concerns in the region about independence and autonomy, and more recent ones stirred by China’s more assertive behaviour. It may well generate goodwill in ASEAN, and help to smooth the way to stronger ties with partners such as Indonesia and Malaysia, which Modi visited just before Shangri-La, as well as with Singapore and Vietnam. Modi’ speech might not be so well received in Canberra or Tokyo, which were mentioned only in passing. Nor will it assuage the concerns of critics who suggest that India lacks the constancy and capability to play a major role in East Asia. Certainly, the speech sidestepped difficult questions about New Delhi’s involvement in minilateral forums, such as the Quad, perceived by Beijing and by critics elsewhere as anti-Chinese. Modi’s argument that India does not seek to align itself with any bloc, but rather aims to be on “the side of principles and values, of peace and progress”, was ingenuous, but I suspect not sufficient to dispel Chinese doubts. What Modi didn’t say – overtly, at least – is that New Delhi now clearly sees Beijing’s ambitions and behaviour as threatening its own autonomy and ability to make choices freely about how best to develop India and secure it. Positioning itself as a champion of a rules-based order, albeit with an arguably more conservative vision of its rules and norms than might be held by some Western states, is one means of achieving that end. The next step (among others) will have to be a much broader, sustained engagement with Southeast Asia, in partnership with other like-minded players, to try and uphold the independence and freedom of action of at least some of that crucial region’s states. Since it began in 1996, the Doha-based, state-funded broadcaster Al-Jazeera has managed to anger every major government in the Middle East.